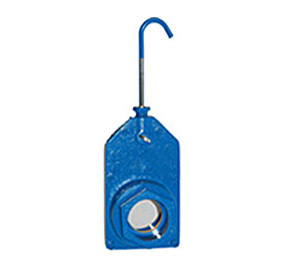 Gage Glass provides an array of blast gate valves and observation ports with configurable options so you can easily install a safe, secure, sturdy and functional port. The right blast gate observation port will allow you to monitor the conditions and levels inside the vessel and ensure the equipment is undamaged and performing normally. Gage Glass provides a full range of threaded blast gate observation ports in different sizes and configurations that are designed to fit seamlessly with your equipment and applications. Threaded blast gates provide an airtight seal that will withstand high temperatures and high pressure, while providing a streamlined design. Gage Glass supplies threaded blast gate observation ports ranging from 2 inches to 6 inches, with a variety of different glass selections available for each product. Select quartz or Pyrex (borosilicate) glass according to the heat conditions you are working with and select a port size that best suits your vessel. If you are working with high temperatures, you can also add a purge connection to the port to vent hot air. The heat, pressure and impact resistance of the blast gate observation port is determined by the type of glass, steel and design of the port. The threaded blast gate observation port is designed with a glass lens, gasket and rings enclosed in a secure, metal bushing. This construction and the selection of materials allow the blast gate port to withstand significantly high temperatures – as hot as 2,048 degrees F for intermittent use. The ports can also stand up to high pressures without warping, cracking or losing its shape. The blast gate will provide a clear view into vessel while protecting your employees, facility and assets. Click on any blast gate to see details on each of the blast gate observation ports available and contact Gage Glass by calling 800-780-3776 to get a quote or place an order.